The solution: open your eyes and enter a new state of mind! Steve Howe is back in the band here and his instantly recognizable guitar sound is clearly present. But the real stars of this album are Chris Squire and Billy Sherwood. Squire's unmistakeable bass guitar sound is as heavy and loud as ever and his bass lines are all over the place. Chris also does a lot of backing vocals that blend perfectly with those of the eternal Jon Anderson. Sherwood was finally made a full member on this album after years of association with the band as session man and backup musician on tour. Sherwood had a big part in the song writing for this album and the style of some of these songs remind me of Conspiracy, the band that Chris and Billy would found a couple of years later. Open Your Eyes consists of good, very melodic songs. The three first ones are excellent. 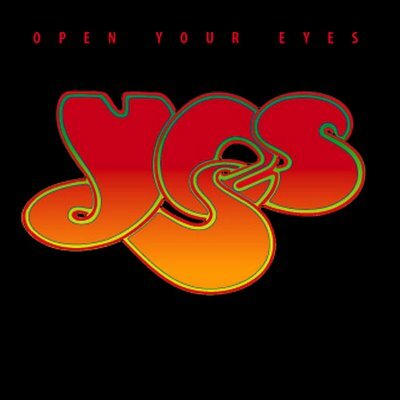 This music is a bit less instrumental and perhaps more commercial� in some sense than many other Yes albums, but it is still miles above 90125. The long-standing and classic rhythm section of White and Squire is intact; the distinctive vocals of Anderson are as strong as ever; the distinctive backing vocals of Squire and Howe; the aforementioned distinctive guitars and basses are also strongly present. In addition, the classic Yes logo by Roger Dean once again graces the cover (quite boring cover art overall though). Some songs are quite heavy - Yes rocks harder here! But they have not lost their subtlety. The relative scarcity of keyboards might be a reason for complaint since there is no Wakeman or Moraz here, or even a Tony Kaye for that matter. But there are indeed still keyboards on this album, played by Billy Sherwood and also by guests Igor Koroshev (who will join the band for their next album and tour) and Steve Porcaro. Somehow...Someday is based on the song O'er that has been on some Jon Anderson albums under different titles and in different arrangements. It is a very folky song. The Folk influence goes beyond this too, Steve plays mandolin and banjo on this album to nice effect.